Its now over six months since the establishment elite prophesied a post BrExit economic collapse apocalypse, a message that clueless academics have continued to regurgitate across the mainstream press for the duration since. However, the most recent economic data continues to paint the exact opposite picture as GDP for the last 3 months of 2016 came in at a very healthy 0.6%. Which in itself followed 0.6% for the preceding quarter, a time when the UK economy was supposed to be in a state of economic collapse! A collapse that has FAILED to materialise! Instead the UK is probably the worlds fastest growing developed economy. For a taste of the perma wrong doom laden commentary then see that which spouted from the former Prime Ministers mouth and the Governor of the Bank of England. The UK manufacturing purchasing managers’ index (PMI) fell to 48.2 in July, down from an initial reading of 49.1. That’s the worst pace of contraction since early 2013. Levels above 50 indicate expansion. Last week, Markit said the initial reading showed “a dramatic deterioration in the economy” in the wake of the Brexit vote. So what more recent dribble have the likes of the FT been peddling, dribble that people actually pay good money to watch or read? “UK growth will continue to surprise on the upside in 2017,” said Marian Bell, .... This economy looks resilient enough to avoid recession. I guess, the FT and the like are waiting for the end of 2017 so that they can finally report Britain enjoyed a Post Brexit Economic boom during 2017. So for the whole of 2017 get used to mainstream press reporting phrase of "UK economy grew faster than expected" as each piece of economic data is published during the year. Yes the UK economy WILL grow faster than the morons that publish reams and reams of nonsense expected! 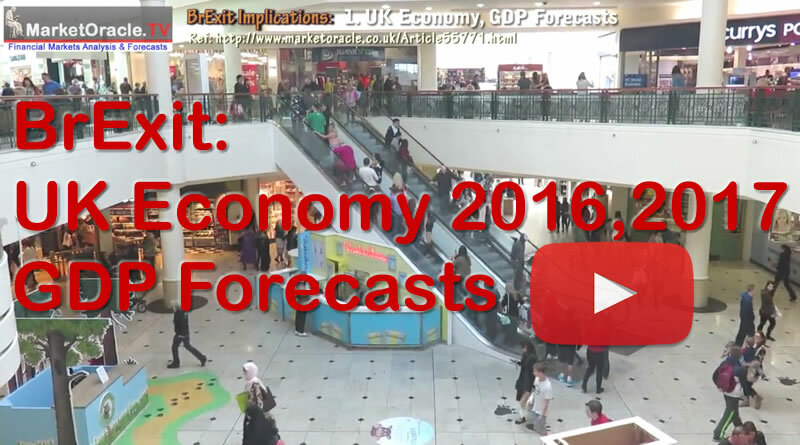 Find out what this means for the UK economy for 2016 and 2017 in my implications of BrExit series of videos. I don't think we have really felt any impact of brexit yet. Recent strong performance is down to brexit QE and very strong sterling devaluation. Because of delayed impact of inflation, we are going to see more sterling devaluation and real impacts of brexit post article 50. I suspect it will feel more like "frog boiling" - where one will realise the significant decrease in quality of like long after brexit. There will always been reasons in hindsight, which is why 2017 will be the year of surprises to the upside for the UK economy, as come Jan 2018 many more reasons in hindsight will explain why the UK economy grew so strongly. Of course you can't invest on the basis of hindsight!